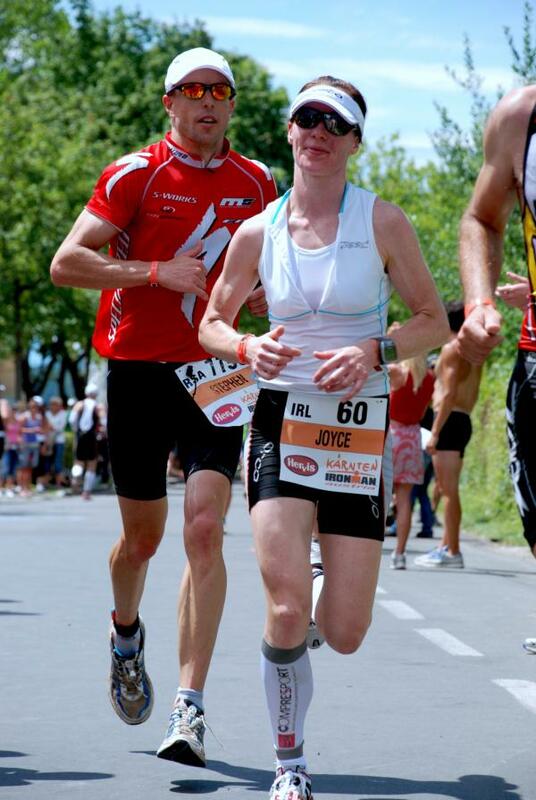 When asked to write a race report on Ironman Austria 2011 and breaking the Irish female Ironman record I thought it was a good idea as its amazing how the memory of a race that you’ve been preparing so long for can be forgotten and so what better way to keep it forever fresh than by writing about the day. However it is not often I put pen to paper and when I do I can be a little long winded so I apologise in advance for my ramblings. Having the race I did on Sunday does not come solely from hard work and to think so is to fool yourself. Personally I think the backbone to any athletes success is having strong support from family, friends, coach and if your lucky sponsors. So before I go any further I would like to take this opportunity to thank a few people. Firstly I would like to say a huge thank you to my family in particular my husband, Michael Buckley and my parents. I had an unfortunate nasty hiccup in my IM prep 7 weeks out when I crashed badly in the hairpin descents of Mallorca 70.3. I broke my jaw and cracked a wisdom tooth. It was a tough 7 weeks to recover in time for Austria and without the help of my parents who ensured I didn’t lose too much weight by keeping me supplied with mashed dinners while I struggled with a soft diet and Mick for helping me mentally to get back on track then the outcome may have been very different. Doing a 5 hour ride with a nervous wreck who is constantly stopping for pit stops as fluid is the only source of carbs whilst training for your own IM and when a stronger cyclist anyway is beyond the call of duty, even if you are married to this wreck! I have also been extremely lucky this year in being sponsored by Tríspórt, a newly formed triathlon club based in Connemara. They have not only provided me with ‘Saoirse’ my felt B16 tri bike but have been so supportive and encouraging. If anyone in the West is looking to join a tri club I can honestly say that you will not find a friendlier, more encouraging and yet driven club. The energy that is going into this new but fast growing club is phenomenal. I would also like to thank my coach Pete Freedman. A guy who says very little but when he does its worth listening and his training plans are spot on! I have so many training friends so its to hard to mention everyone but there are a few who have done some serious miles with me, thank to Peter Meaney, John Meade, Sean Finn and of course my dog Charlie Browne. Lastly as I’m sure most athletes know when you push your body to the extreme niggles are to be expected. It is managing these and avoiding an injury that could break the consistency of your training that is key. Being a physiotherapist with my own private practice I know what to do to stop this happening but its not easy treating yourself. I’m fortunate to have a colleague, Mark Evans working full time with me. He is extremely giving with his time and has sorted out numerous niggles now! He also manages the practice whilst I’m away racing which allows me to focus on the task at hand and yet have the peace of mind that everything will run smoothly at home. And so onto the report. Some of ye may know that I set myself two goals last year to qualify for Hawaii and to break the Irish female IM record. The first I achieved, the second I missed by 48 seconds. It is amazing how many places on post race dissection you can find 48 seconds over the course of a 9h46m race but perhaps it was meant to be as I came back stronger and more determined this year. I decided to race pro this year for 2 reasons, one I placed 7th overall last year and secondly its one way of getting into a race that fills in minutes. The morning of July 3rd dawned and with it brought perfect conditions with temperatures being almost 10 degrees less than last year. Racing pro gave me the advantage of a 10 metre headstart on the main field and as I was very nervous of taking a hit to the jaw this was a serious blessing. Despite my sister Amy advising me of her new phrase ‘of get gone and get on’ I didn’t last long on the feet of the main pro pack but I caught age goup packs as they went along and on exiting the water in a pb time of 58.mins I got a great boost that this may be my day. I felt great heading out on the bike but some fast women were passing me and I let them go as I felt it was a pace too much for me. I had a pretty constant effort (Heart rate) and speed through the 2 loops of the bike and excluding a few tummy upset moments and some nervous descending and cornering (as my crash is still pretty fresh) and almost missing a turn and cycling into a barrier as I was so focused on effort it was a solid bike and Saoirse brought me to a new IM bike pb of 5h03mins. I’m sure this was also aided by Peter Kern of PB3 Coaching who had kindly done a bike fit for me. Into T2 and out onto my favorite section the marathon, my stomach was a bit dodgy initially but I still did a 6.45 first mile so I settled it down and despite an emergency portaloo stop I maintained 7min miling for quite a while. At 21k things starting getting tough, the legs were protesting and I needed to dig deep, stay focused and believe in the training. I also had a pack of Wolfies spread out along the run course with Mick, my brother Eric, my sister Lorna and my parents all shouting words of encouragement. I even had Lorna singing me lady gaga, the edge, which worked beautifully to bring a smile and to remind me not to take myself too seriously and remember I’m doing this because I love it. And so the kilometres ticked by and some girls got passed. I had planned not to look at my overall time till well into the run but by then anything but concentrating on leg turnover was too much so I asked Mick at some point around 30k was I on target and he said yes 9.30, then a little later Eric and Mick were saying 9.20 and on the last k Mick said 9.15. I honestly didn’t believe him and it wasn’t till I turned the corner of the finishing chute that I truly believed in what I had achieved. A pb IM marathon split that put the icing on the cake. It was a very very happy last 200metres and tears of joy and shock replaced last years tears of mixed happiness and disappointment of coming so close to breaking the record. 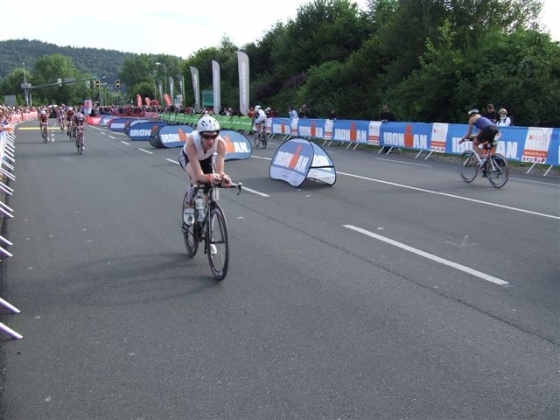 A couple of days on whilst writing this in Roth (as Mick is doing his first IM Sunday and the tables will turn where I’ll be the nervous one watching) I am a very content girl. I placed 8th overall, 7th of the pro’s with a competitive starting field of 15 and I did what I set out to do, taking 30mins of the record that Tara Nolan had so impressively set and held for so long. I generally never find the training a drag as I love it and everything to do with it, except for training with the pain of a broken jaw, but still there was a lot of hard work put in. Some long cycles in the cold and rain, weeks on end of turbo work due to a ridiculously cold winter so it is very nice to get the reward I dreamt of for so long. Who knows how long I’ll hold this title, probably not long at all as the standard in Ireland is getting so high but whilst I do I will be very proud.